St. Anne serves a wide variety of Orthodox families and individuals in the greater Knoxville/Oak Ridge, TN area. Founded in 1997-98 as a mission of the Orthodox Church in America, the parish has steadily grown to serve members from many international backgrounds as well as a wide variety of converts. We have members of all ages and an active Sunday School program for our youth. 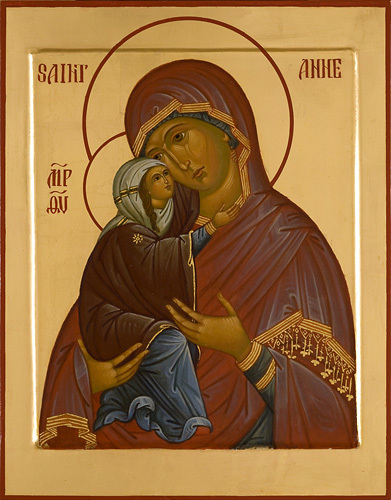 We at St Anne’s are very committed to the establishment of a vital witness to the Orthodox faith in the surrounding region and have been active in helping to establish other parishes, including St. Tikhon's in Chattanooga, TN, St. Athanasius in Nicholasville, KY, St. Maria of Paris in Cleveland, TN, and Protection of the Holy Virgin in Clarksville, TN. The parish conducts its services in English and follows the New Calendar. We offer classes year-round for those who are inquiring about the Orthodox faith or who would like preparation for being received into the Orthodox Church. Our weekly newsletter: Click to view calendars, announcements, and reflections on the feasts and saints. To receive the St. Anne Newsletter by email, follow this link.